show off a SAC Care Package. Your student(s) will be notified via campus mail and email that they have received a care package and will be able to collect it on either Tuesday, May 8 or Wednesday, May 9, 2018. 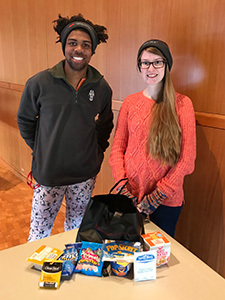 If your student does not pick up their package on either day, or make alternative pick-up arrangements with us, we will donate their care package to the Student Health and Counseling Center (SHACs) to hand out to students in need of a kindness care package. Orders placed after Wednesday, April 18 will incur a $10 late fee. Final care package orders are due Wednesday, April 25, 2018. Please note: You will be able to submit a personalized message after you complete the purchase. On the confirmation screen, you will be provided a link to submit your message. If you are purchasing a Kindness package, please click the box to remove the name fields.